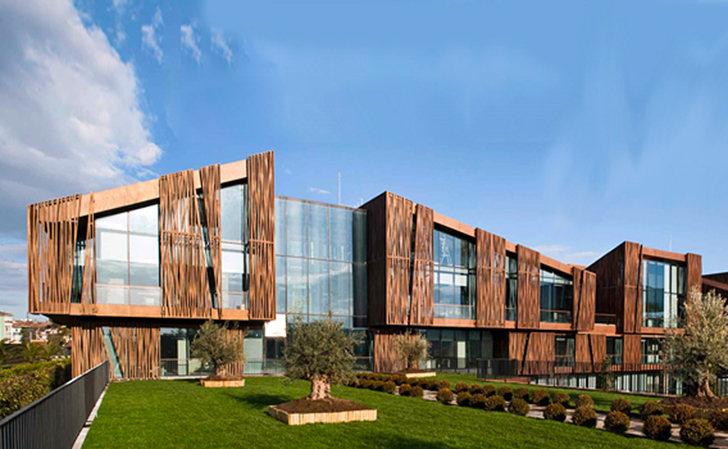 The Selcuk Ecza Headquarters is an office building in Istanbul that looks like a cluster of small houses connected through roof gardens, patios, paths and atriums. The building, designed by Tabanlioglu Architects, tries to redefine the typology of office architecture and give it a warmer home-like feeling. It was awarded the Best Office & Business Development 2015 award at MIPIM International Property Fair in Cannes, France. The five-story building was built for a pharmaceutical company whose owners, an elderly couple, wanted to build an office space that would look and feel more like a house. This air of domestic space was given to the structure by treating it as a small county settlement, with seven smaller volumes connected through different green surfaces and patios. The volumes have a hipped roof and feature a facade that looks like its made from wood. A bridge leads to the main entrance located on the ground floor, while the first floor houses offices for managers and partners, dining halls, activity rooms and VIP lounges. The interiors are bathed in natural light thanks to the building’s transparent sides. In order to increase the efficiency of passive climate control, the architects introduced an envelope designed as a mesh system. 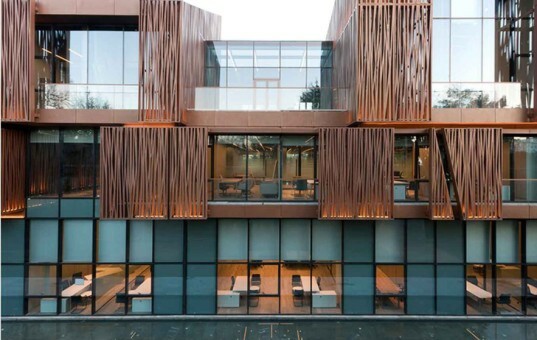 The five-story building was built for a pharmaceutical company whose owners, an elderly couple, wanted to build an office space which would look and feel more like a house. This air of domesticity is given to the structure by treating it as a small county settlement. Seven smaller volumes are connected with different green surfaces and patios. The volumes have a hipped roof and feature a facade that looks like its made from wood. A bridge leads to the main entrance located on the ground floor, while the first floor houses offices for managers and partners, dining halls, activity rooms and VIP lounges. The collective structure looks more like individual buildings rather than one large space. The interiors are bathed in natural light thanks to the building's transparent sides. In order to increase the efficiency of passive climate control, the architects introduced an envelope designed as a mesh system.